FOOTBALL—Federation of Uganda Football Association is resigned to losing Milutin ‘Micho’ Sredojevic according to information PML Daily has obtained. A source at Fufa House in Mengo told this news website Monday evening that the day-long meetings that saw Fufa officials try to persuade Micho to stay were fruitless. The source who did not want to be named because they are not authorised to speak to the media about the matter until the federation calls a news conference, said officials are now expecting to receive a formal letter of resignation from the Serbian tactician in the next few days. At the centre of Micho’s expected untimely departure are lucrative offers from other clubs as well as what officials believe is the sneaky works of Egyptian officials to throw the Cranes off balance ahead of their crunch Fifa 2018 World Cup qualifier double header. Monday evening, Micho, who had on Saturday told the nation that he would reveal his decision within 48 hours, tweeted that he had stayed the decision to give negotiations a chance to prevail. The 47-year-old tactician had also earlier lashed out at former Fufa executive Allan Ssewanyana, who has often accused of meddling in his affairs and dragging his name in politics. Ssewanyana, who is also a legislator, has continuously announced Micho’s positions on social media, but the coach always counters them, insisting that the MP was only using his (Micho’s) predicaments and other issues for political gain. On Monday, the Serbian accused Sswanyana of constantly linking him with a move to Libya. “Please stop picking political points via my unfortunate situation. I closed Libya deal months back blocking all calls from +218,” Micho tweeted. With confirmation from Micho that Libya was no longer in the picture, the question on who is flashing irresistible pay cheques in his face goes down to south. This news website reported yesterday that Micho had received a mouth-watering offer from South African struggling giants Orlando Pirates. The Absa Premier League side have reportedly thrown cheques worth $50,000 in monthly emolument at Micho. That is at least five times what the man whose tactical acumen won Uganda Premier League record champions SC Villa their last title 13 years ago earns in Kampala. Fufa can’t match the offer from Orlando Pirates even if they wanted to. The most they could do is convince him to see through the World Cup qualification campaign with the hope that the prospect of taking Cranes to Russia in 2018 would be more appealing for a legacy than the pay cheques the Pirates were throwing at him. 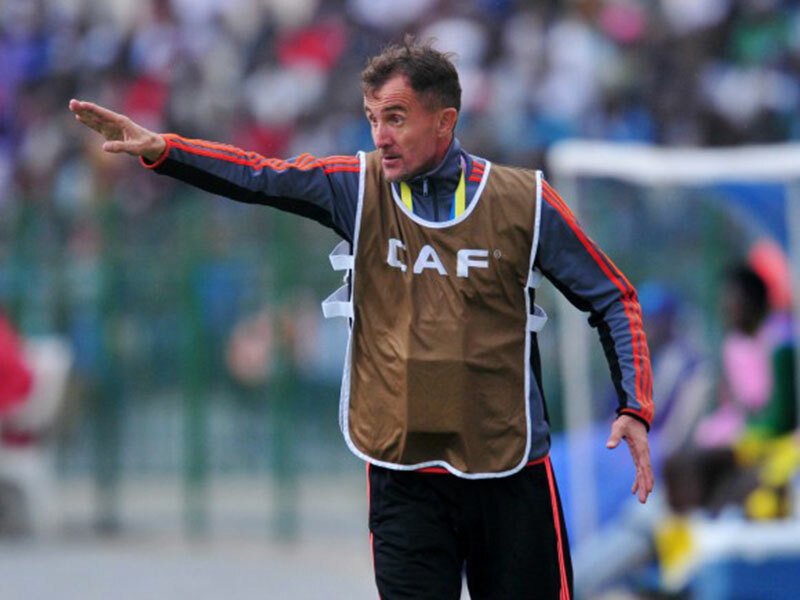 Micho is said to debating on whether to for the lucrative offer or stay and flirt with legacy. The latter scenario I hinged the fact that having rebuilt the Cranes into a formidable side and exorcised the jinx that had befuddled Uganda in major showpieces for 38 years, his market value will remain on the high end regardless of whether Cranes make it to Moscow or not. However, such is the position FIFA, rather than Nicholas, are in. The Serbian is only hesitating as he waits on the federation to sort his outstanding arrears. “He hasn’t yet officially resigned but it 100 percent certain that Micho is leaving,” the source said. Meanwhile fears of the invisible hands poking Micho continue to grow. There is growing sense that World Cup qualification Group E leaders Egypt are working behind the curtains to unsettle the Cranes coach. Things were not helped yesterday when Micho took to Twitter to question why Egyptian media were poking their nose so much into his pending decision. Although Egypt top the group and are now firm favourites to qualify, they have infamously faltered whenever most in World Cup campaigns. The Pharaohs were the first African nation to play in a World Cup final in 1934 and made the grade once more at Italia ’90. But since then they have been bridesmaids. But the road to Moscow has started brightly from the record African champions after two straight wins over Ghana and Congo. With Ghana failing to beat Uganda in Accra, Egypt now feels the Cranes pose the biggest threat to their dream. Egypt top Group E after beating Congo in Brazzaville and Ghana in Cairo. Uganda, who held Ghana to a priceless draw in Accra, are second, two points behind the North African giants. But there is a double header up next and the Pharaohs are feeling jittery over the chances of Cranes under Micho. August 31 is so far away, yet so close for the Egyptians. Uganda Cranes are unfazed at Namboole. The Egyptians are not taking anything for granted. Already, their ‘spies’ have touched base in Kampala as advance party with a strict assignment: Digging up every information available on Uganda football that can be used in the double header to ensure Egypt do not drop points. That is their assignment. Win in Kampala and Egypt will virtually have put a leg in Russia ahead of the match in Port Alexandria six days later. That August 31 match in Kampala will be at Mandela National Stadium, Namboole, at 4pm local time. Only Togo has the magic to unlocking Cranes at the stadium, but the Egyptians are not leaving anything to chance: their advance party has already reported that Namboole is in shambles. To this end, Egyptian FA is seeking a way to have Namboole’s ‘potato pitch’ worked on so that their players, who are used to better playing turfs in Europe or in better managed facilities at home and in other countries, will not feel the bump. Egypt intends to get Namboole stadium managers to agree a deal where the North Africans fund the refurbishment of the pitch ahead of August 31. However, as the Pharaohs try to find favourabe grounds, they are aware that the current Cranes set up is not an equation of good turf. Egypt know what it was like and they need not look further than when the two sides locked horns in Port Gentil. Back in Gabon, it took the record champions 89 minutes to break Cranes courtesy of substitute Abdallah El Said. It was a drab game, but that was not the true account; Uganda were good and are still good. Drawing with Ghana away was no fluke either. Egypt knows if they cannot beat Cranes home and away, they will hand the leverage to top the group and qualify on a silver platter to Uganda Cranes, who will only have to beat Ghana at the fortress that is Namboole and pick up the mandatory three points in Brazzaville to qualify for their first World Cup final. The Egyptian advance party appear to have indicated Micho as the quota pin in Cranes rise and removing that pin will dislocate the Cranes wheel. And by remove, it means by any means, including coaxing South African struggling giants Orlando Pirates to tap Micho. With the Egyptian hell-bent on leaving nothing to chance, it is understandable that Micho has questioned their interest in his fate and that some Ugandans are already faulting them for playing with third parties to price Micho away.